No matter what you might think, this devotion is not about two teenagers. The first teenager is Anne Frank. As most of you know, she was a Jewish girl who spent two years hiding from the Nazis in Amsterdam. Eventually, she and her family were found, arrested and, with the exception of her father, died in the Bergen-Belsen concentration camp. It was only after her father returned to their hiding place that he found his daughter's diary. The book has touched millions and today, Anne Frank's hiding place has become a museum. including what he wrote in the museum's guest book. At the end of his time at the museum, Bieber penned the idea that he hoped if Anne Frank had been alive she "would have been a Belieber." No, that's not a misspelling on my part. Bieber's fans are called Beliebers." But this devotion is not about two teenagers. It's about how people have responded to what Justin Bieber wrote at the museum. Some people were slightly upset with the young man, while others were outraged, scandalized, horrified, disgusted, disappointed, dismayed and appalled. The common thinking was what an ego! How dare he think of himself at such a time and place? That's the way most people felt -- most -- but not everybody. A spokeswoman for the museum, a Ms. Mostart, defended Mr. Bieber. She told the BBC, "He's 19. It's a crazy life he's living. He didn't mean bad ... and also it's nice that he made the effort, he didn't have to come." I don't know if Ms. Mostart is a Christian, but she sure was following James' advice about being quick to hear and slow to speak out in anger. As Luther said, she had put the "best construction on everything." Over the years I've found that some sins are easier to deal with than others. For me (and for many), saying things about others in the kindest way does not come easily. Without waiting to investigate the facts, without giving the benefit of the doubt, without ever bothering to consider if I have anything positive to say, my tongue gets engaged, and I start spewing out seemingly endless streams of critical commentary. That is hardly the kind of thing that benefits my neighbor or gives glory to my Redeemer. This is why I would encourage you -- you who probably no longer are a teenager -- to use your tongue to honor the Redeemer on Monday through Saturday as wonderfully well as you do on Sunday. I know I'll try too. 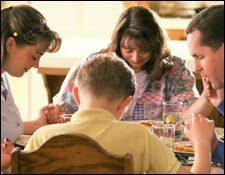 THE PRAYER: Dear Lord, through the week may the words of my mouth and the mediation of my heart be acceptable to You. In Jesus I ask it. Amen.